As the designer on the growth team at Mapbox, I decided to do a UX audit of the sign up and installation flows for our products. After an A/B test with muddled qualitative and quantitive results, I realized that some fundamental ux friction points in our onboarding process needed to be addressed to help us achieve a more unified and seamless first-time user experience. I began with an audit of all four of our current installation flows and combed through our qualitative and quantitative data from our previous a/b test. I then put together two user flows, one for our current sign-up flow and one for a task-based sign-up flow that we had a/b tested. Each user flow focuses on three different user intents. 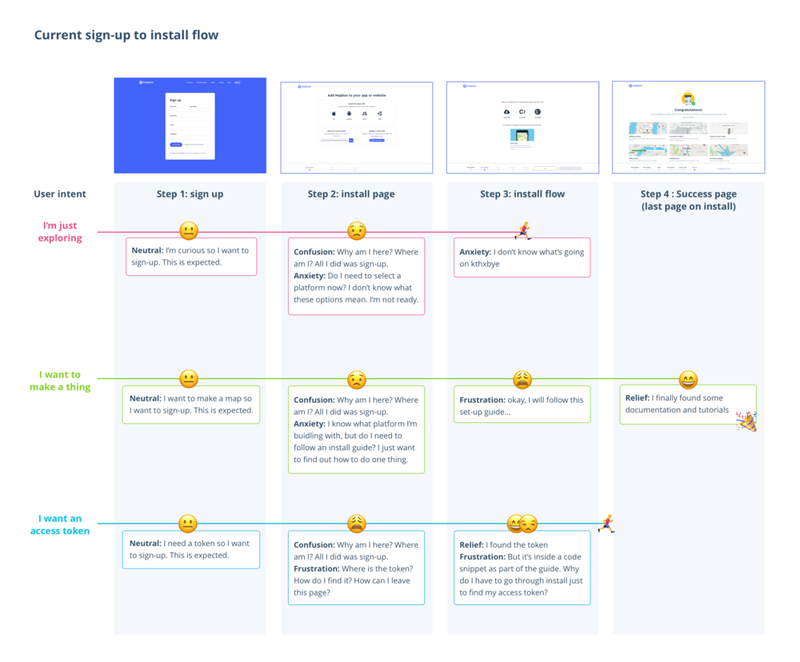 I used these flows to help communicate a story to my team of where, how, and why users felt the most pain points through our current install flow and the task-based install flow test. I then created mock-ups to show how we could remedy these friction points, engage users better, and make it easier to complete their tasks. My suggestions range from significant changes to the fundamental sign-up experience to small low-hanging design tweaks.